Just a few hours each week could bring companionship to an older person living alone, or allow a carer to have a much needed break. 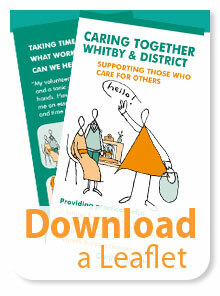 Caring Together is always recruiting new volunteers. There is no age limit. We take two references and run a police (DBS) check. We then introduce volunteers to the service with care, especially the strict rules surrounding confidentiality. Our volunteers are not involved in personal care and cannot undertake any lifting. There is ongoing support from office staff at all times. Regular meetings are both an opportunity for training and to help volunteers feel part of a team. 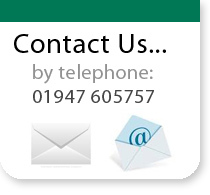 Training sessions cover a wide range of topics and we have occasional visits from other service providers to explain the services they offer. Volunteers enjoy social events including a celebration in Carers Week, a Christmas Lunch and fund-raising efforts such as Domino Drives. 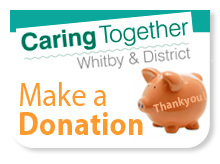 As both a registered charity and voluntary organisation, Caring Together offers the following services. The volunteer gives an hour or more of their time on a regular or flexible basis to sit with the person being cared for, to enable the carer to have some time on their own. The volunteer offers time on a regular or flexible basis to visit an elderly person living alone who has an identified carer not living with them. These people have few contacts and would benefit from additional support and companionship. For the delivery of these services we offer our volunteers support in the form of travel expenses and regular contact meetings. 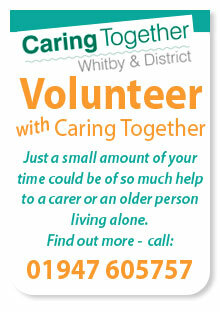 “Great support from Caring Together - my volunteer visits every Tuesday. It's extemely helpful!” A comment by a user of our services.